During WW2, convicted bank robber Eddie Chapman becomes a triple agent working for both the British and the Germans. Father Oliver Van Horne: One missing. One drunk. Swell. To some extent Ralph Nelson's "The Wrath of God" spoofs westerns, but like Nelson's "Lilies of the Field," under the comedy is, I think, a deeply felt belief in divine grace. Both movies focus on unlikely human materials having a vocation they fail to recognize and consciously resist. 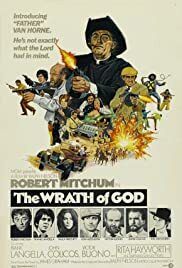 Herein, Robert Mitchum plays a con man masquerading as a priest and a Catholic martyr in the tradition of Thomas à Becket or Thomas More mistaken by many as a hedonist. In her last screen performance Rita Hayworth has preternaturally red hair (fire-engine red, not a color of any natural human hair), few lines, and is required to look devout (which she manages to do). As her flamboyantly traumatized and traumatizing son, Frank Langella gets to chew up the scenery, which he does with great relish (before "Dracula," after his memorable film debut in "Diary of a Mad Housewife" and Mel Brooks's adaptation of "The Twelve Chairs"). Ken Hutchinson does fine as the token normal guy who is embroiled in others' plots, including the romantic subplot that involves him with a mute Indian maiden (Paula Pritchett). In a Sidney Greenstreet-kind of role as a corpulent and corrupt gun-runner Victor Buono is suitably droll. Still, it is Mitchum's movie, and he is as compelling when he takes his priestly role seriously as when he plays the usual disengaged but competent existentialist who expects nothin' from nobody. <bt><br> A motley gang of foreign mercenaries getting involved in the confusions of the long-running Mexican revolution and taking a side against their financial interest recurred in a number of late-1960s and early-70s movies, including "The Wild Bunch", "The Professionals", and "A Fistful of Dynamite." The latter two use considerable humor within the genre of expatriates taking sides (which in Mexican settings of different eras includes "Vera Cruz", "Old Gringo", and "Bring Me the Head, of Alfredo García").